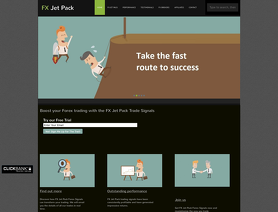 Join FX Jet Pack for revolutionary Forex trade signals. These signals have been highly profitable and will be sent to you by email throughout the day. I am a full time Forex trader and the signals that I send are the same trades that I take on my own trading account. I have complete confidence in them and this is why I want to make these Forex trades available to a limited number of retail traders. So why not join us, and boost your FX trading to a new level. FXJetPack are really good and I am very happy that I joined them. With Forex signals made 105pip in three days which is amazing, I have made some good money. I signed up for a week of signals from FX Jet Pack and was impressed with their trades and signals - very easy to follow and always available to contact via E-mail. I have now signed up for monthly signals based upon my experience so far. I've had 2 trials with this company, one last year and another recent trial. The latest one has convinced me to sign up for a full membership, going off their performance. Hopefully this will continue and be a profitable year, as I haven't had any luck with a few other signal providers unfortunately. In short I would say that FXJetPack are really good and I am very happy that I joined them. I tried a couple of similar companies providing Forex signals but I've been with FXJetpack a few months now and have made steady consistent profits. There have been a couple of weeks ending in a loss but overall, I have made some good money.